Hiking the Jesus Trail is a once in a lifetime experience for every Christian. The Jesus Trail passes through Nazareth, Cana, the Mount of Beatitudes, the Sea of Galilee and Capernaum. You can continue hiking on the Israel National Trail and be baptized in the Jordan River, climb Mount Tabor and ascend Mount Precipice. The hike ends in Jerusalem. You will visit the Church of the Visitation, the Room of the Last Supper, Gethsemane, the Tomb of Mary, the Via Dolorosa and the Holy Sepulchre. Bethlehem is only ten kilometres from the trail. Pilgrims frequently describe their hike in the Holy Land as a life-altering experience. After their journey a group of pilgrims from Italy wrote: "When we completed the hike of the Camino de Santiago de Compostela - Way of St. James, we were excited. But it was nothing compared to what we felt when we ended our hike of the Land of Jesus in the Holy Sepulchre in Jerusalem". The Golan Trail is one of Israel's most beautiful trails. It starts on Mt. Hermon 2,000 meters above sea level, and ends by the Sea of Galilee, 200 meters below sea level. You will hike on roads and alongside aqueducts built by the Romans. The region's basalt plateau is one of the largest in the world. 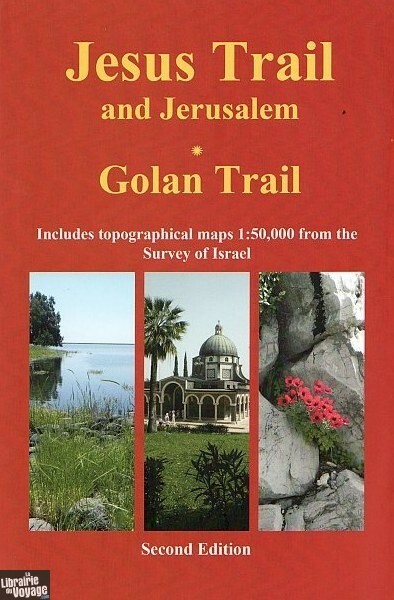 The Golan trail is 130 km long, rich in fauna and flora. The best time to hike the trail is late winter and spring. 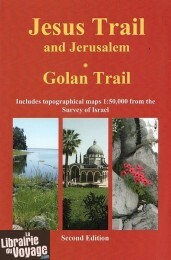 Jacob Saar and Yagil Henkin are the authors of the original Israel National Trail guide. - The guide includes the only topographical maps of the region 1:50,000 in English. - Maps of Jerusalem 1:15,000. - Hike description with elevation charts. - Historical information about dozens of biblical and other sites.